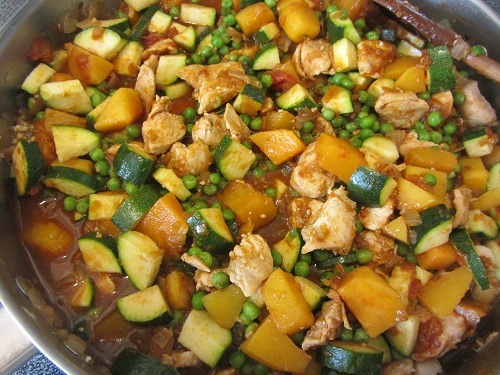 Chicken Curry with Vegetables is a simple, quick, healthy meal. The use of Trader Joe’s Simmer Sauce, chopped butternut squash, and whole wheat couscous that cooks quickly, leaves only a bit of up front preparation. If you can chop an onion, jalapeño, chicken, and grate ginger, you’ve got the cooking ability to make this meal! It’s that simple and it’s tasty too! A healthy diet habit is to collect 10 or 20 of these types of healthy recipes so you won’t be lured into the call of fast food! When your family needs to eat quickly and you are tired, this is still a really nice meal that you can whip out. 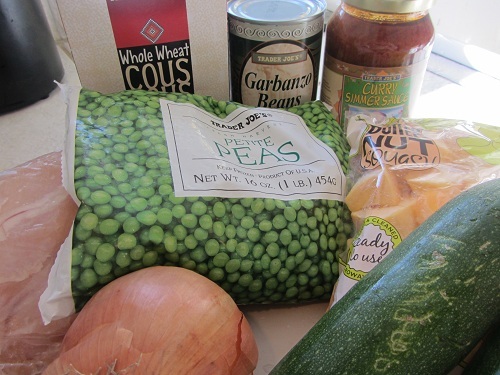 I always leave a jar of the simmer sauce, garbanzo beans, and whole wheat couscous in my pantry, and peas in my freezer. I’m set. If you don’t have all the ingredients it turns out just as good with just chicken, peas, and the curry sauce over couscous! Simple! 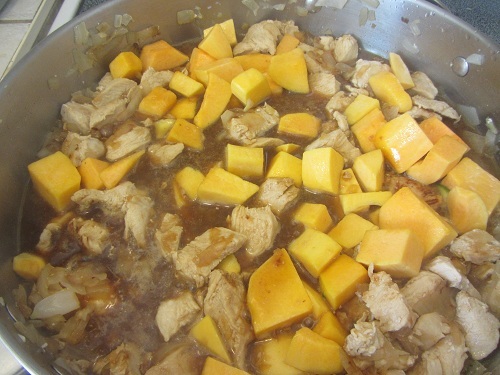 Add a chopped butternut squash, jalapeño, water, cover and simmer for 10 minutes. Add the peas, garbanzo beans, Curry Simmer Sauce, salt and pepper. Heat through. Serve over whole wheat couscous and garnish with raisins if you like them. *If you don’t want meat, this meal can be made vegan or vegetarian by just leaving out the chicken. 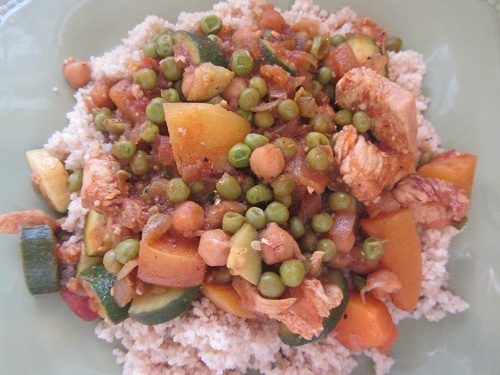 There is plenty of protein with the garbanzo bean and couscous combination! 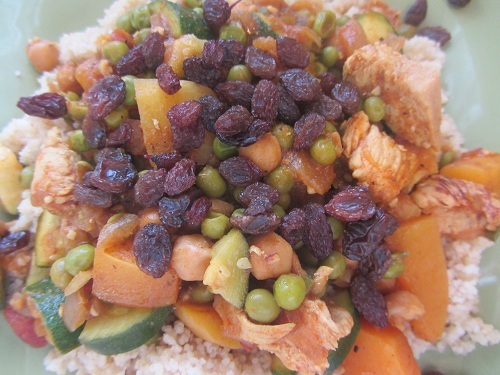 This recipe is a combination of curry and a Mediterranean couscous recipe I love. I’ve simplified it because most of the time quick meals make more sense. 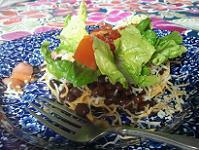 Enjoy this healthy Main Dish Recipe! Please share your healthy main dish recipes, and I will possibly include it, especially vegetable laden ones, that are low in fat. 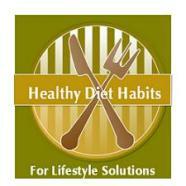 If your family loves a recipe that is healthy, others will enjoy it too! If there is a way to make your recipe healthier by making substitutions, then I will make suggestions when I review YOUR recipe!